This measure adds to an earlier one negotiated within the Framework for Cooperation in November 2013, in which Iran agreed to further clarify its 2010 announcement about its capability to enrich uranium with lasers. 2 According to the February 2014 IAEA Iran safeguards report, Iran at least partially explained this 2010 announcement. To resolve the outstanding concerns about laser enrichment, Iran will need to provide much greater cooperation than demonstrated so far. In a 2013 ISIS Imagery Brief, ISIS used commercial satellite imagery to investigate the Lashkar Ab’ad site, where Iran conducted secret laser enrichment activities into 2003. Since this site was originally the home of a facility involved in a major violation of Iran’s safeguards agreement, the IAEA would want on-going visits to this site, particularly since it has remained involved in related activities, namely laser research and development. As described in the Imagery Brief, the IAEA is also expected to want to scrutinize this issue in more depth because Iran has taken other steps that have compounded suspicions that it has revived uranium laser enrichment activities. It has developed advanced lasers suitable for uranium enrichment, undertaken extensive construction at the Lashkar Ab’ad site during the last several years (see figures 1 and 2), and made a 2010 high-profile announcement about having a uranium laser enrichment capability. Laser enrichment poses a proliferation threat because, if properly engineered, it has the potential to dramatically advance the capabilities of proliferant states to secretly enrich uranium. Although enriching uranium with lasers on a production-scale appears extremely complicated, laser enrichment of uranium warrants concern as a potential way for a proliferant state to acquire significant quantities of highly enriched uranium. A covert laser uranium enrichment facility might escape detection by the IAEA and Western intelligence services because of the relatively small size and few external indicators of such plants. Additionally, Iran could conduct several necessary research and development activities of laser uranium enrichment under a non-nuclear cover. In a January 18, 2014 letter to the IAEA, Iran stated that the 2010 statement was made based on its “past R&D experiences in the field of laser enrichment which ended in 2003” and that since then “there had not been any especially designed or prepared systems, equipment and components for use in laser-based enrichment plants in Iran.” 6 This statement appears to include that Iran has not operated a secret laser enrichment plant since 2003. This is a welcome statement, and it meets the requirement to “further clarify” the 2010 announcement, although one has to accept that it remains unverified by the IAEA. There is a more fundamental problem with the answer. It does not address the key concern raised by the 2010 announcement, namely that Iran is developing further its capability to enrich uranium with lasers, much of which would not involve actually using “especially designed or prepared” systems. Its current answer shows that Iran so far has taken a minimal approach to addressing the IAEA’s concerns about laser enrichment. Under the new measure, Iran is to provide the IAEA with additional relevant information and arrange for a technical visit to Lashkar Ab’ad Laser Center. Iran should provide enough information and a sufficiently detailed technical visit to allow the IAEA to assess the status of Iran’s work on laser enrichment, including its current relevant developments and its future plans. Iran should also make available Iranian experts who can address the IAEA’s technical questions. Figure 1. Digital Globe Imagery showing Lashkar Ab’ad site in June 2003 after the undeclared program was halted. The undeclared enrichment occurred in the larger building shown. 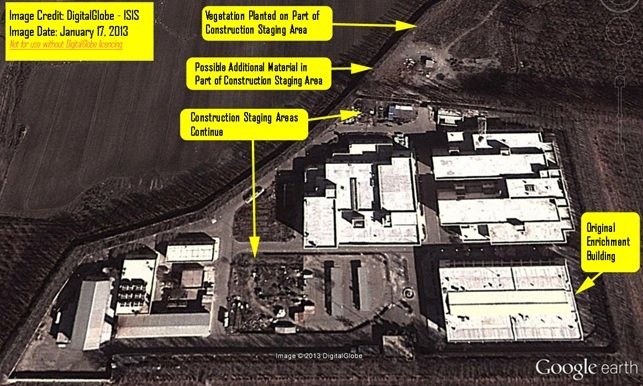 While Iran was voluntarily implementing the provisions of the Additional Protocol from 2003 to 2006, the IAEA verified that Iran did not reconstitute enrichment activities at this site. Since 2006, Iran has allowed one IAEA visit to this site in 2008. During this visit, Iran told the IAEA its general plans for the site, including major construction projects. However, given that this visit was not an inspection, the IAEA inspectors were limited in what they could learn and verify about Iran’s past and present activities. Figure 2. 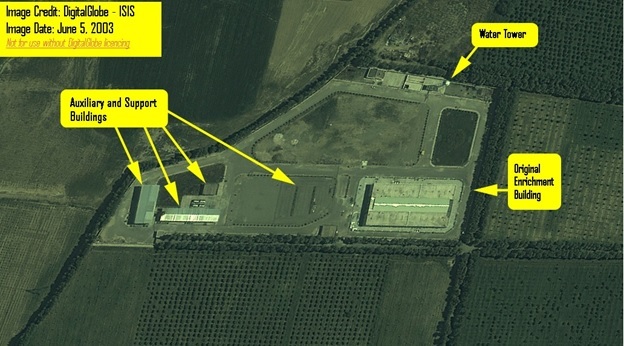 Early 2013 image of Lashkar Ab’ad site showing a greatly expanded facility. This site has conducted work on developing and manufacturing lasers and researching nanotechnology, some with the aid of lasers, according to Iranian statements and publications. 1. “IAEA and Iran Conclude Talks in Connection with Implementation of Framework for Cooperation,” IAEA, February 9, 2014, http://www.iaea.org/newscenter/news/2014/iaea_iran090214.html. 2. David Albright and Andrea Stricker, Iran’s Negotiating Track with the IAEA, ISIS Report, November 26, 2013. http://isis-online.org/isis-reports/detail/irans-negotiating-track-with-the-iaea/8 3. “Iran’s Latest Achievements in Laser Technology,” Iran Press TV video, February 8, 2010. http://www.youtube.com/watch?v=8snVEsyzvK4. 4. “Good Nuclear News, Iran Possesses Laser Enrichment Technology,” Presidency of the Islamic Republic of Iran Website, February 7, 2010, http://www.president.ir/en/20255 5. “Iran Scientists Gain Full Access to Laser Tech,” Islamic Invitation Turkey, February 8, 2010. 6. Director General, IAEA, Implementation of the NPT Safeguards Agreement in the Islamic Republic of Iran, GOV/2014/10, February 20, 2014, http://isis-online.org/uploads/isis-reports/documents/iaea-iranreport-02202014.pdf.